Fallibilism goes beyond the simple recognition that everyone is fallible. It demands that any ethical and equitable quest for truth (or beauty) must be founded on a commitment (not just willingness) to SEEK OUT (not just be open to) alternative viewpoints, which might contradict those of other people (friend or foe) and might even run counter to one’s own cherished beliefs (including a belief in fallibilism itself)! A fallibilistic comment is often curiously interpreted as being contentious, as if one person’s viewpoint could be discredited by stating possible alternative viewpoints. 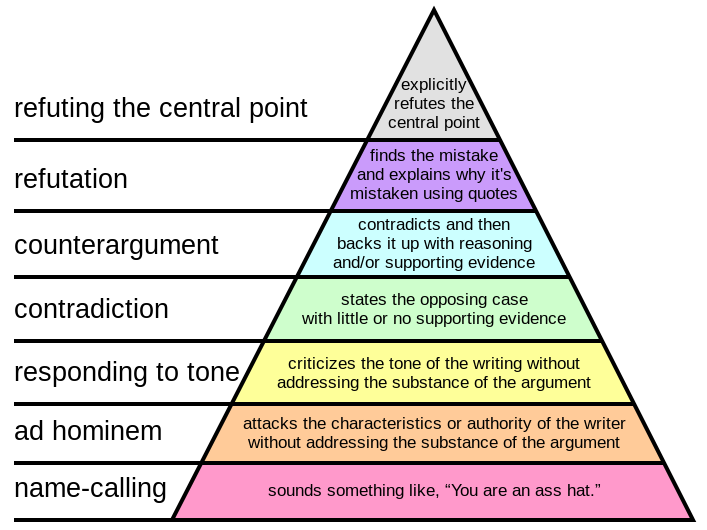 A fallibilistic comment might seem to be a “contradiction” in Graham’s hierarchy of disagreement, shown above, but it usually isn’t. A fallibilistic comment doesn’t actually refute the point — instead it points out the possibility that the point might be wrong. A fallibistic comment draws attention to EVIDENCE that is lacking to confirm or refute the point. Therefore, a fallibistic comment leaves the original point unresolved (pending accumulation of evidence, one way or the other). This entry was posted in Thoughts and Tips. Bookmark the permalink.